Meru Vakrasana (मेरु वक्रासन – Meru Vakrasana in Hindi) is also called the Spinal Twist Pose. The practice of Meru Vakarasana makes the spinal column more flexible. This asana stimulates spinal nerves. It has a strong impact on the abdominal muscles by alternately stretching and compressing them and thus enhancing the pranic flow in the region, particularly around the navel. Among all the spinal twisting yoga poses, the Meru Vakrasana is the only asana, which can be recommended during pregnancy. Meru Vakrasana is preparatory asana for Ardha Matsyendrasana. Spread a Yoga Mat and sit with the legs outstretched, feet close to each other but not touching. Place the palms on the floor by the sides, behind the buttocks, fingers pointing backward. Turn the trunk to the right, raising the left buttock slightly, bend the left knee and place the left foot just outside the right knee. Place the left hand just close to the left foot, which is just outside the right knee, with the fingers pointing in front, as the toes. Twist the head and trunk to the right, looking over the right shoulder, but without straining. Keep the spine in an upright position while keeping the back relaxed. This is the final position. Remain in the final position as long as is comfortable. If the posture can be held for a longer period of time then breathing should be kept normal. Repeat the same process on the other side following the same steps. People suffering from a hernia or peptic ulcer should practice this Yoga Pose under the guidance of an expert Yoga Teacher. Beginners should be careful while twisting the trunk and should not exceed their limit. As Meru Vakrasana is a sitting twist pose, it stretches the spine, loosens the vertebrae and tones all the spinal nerves. It is a very good Yoga for back pain. This simple Spinal Twist Yoga Pose is very good for neck pain. Meru Vakrasana alleviates lumbago and mild sciatica. This Yoga asana nourishes the abdominal organs such as liver, pancreas, kidneys, small intestines, and gallbladder. Among all the spinal twisting yoga poses, the Meru Vakrasana is the only asana, which can be recommended during pregnancy. 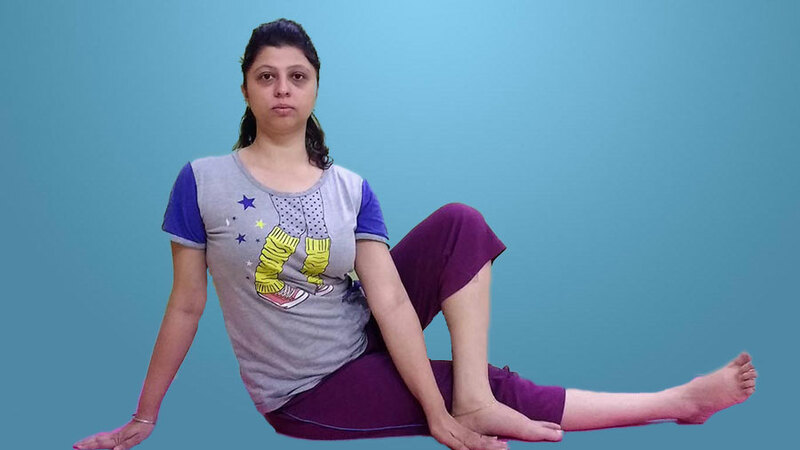 Meru Vakrasana, a simple Spina Twist Yoga Pose, is a great Asana for the beginners, as it prepares them for more difficult Twisting Yoga Poses. This asana should be practiced after forward and backward bending asanas have been practiced and before the inverted asanas (inversions).